Update: On Saturday 6th February, 2016, President Hollande attended the first sporting event to be held at the Stade de France since the outrage of the 13th November. It was for the 'Six Nations' rugby match between Italy and France. This time there was a considerable security presence but it passed off without incident (except on the pitch!) His popularity now returned to an all-time low after the post terrorist 'bounce', the following rather delphic remark was attributed to him by the 'Times': "Life must go on and we must put on shows like this, yielding nothing." Whatever was he thinking? 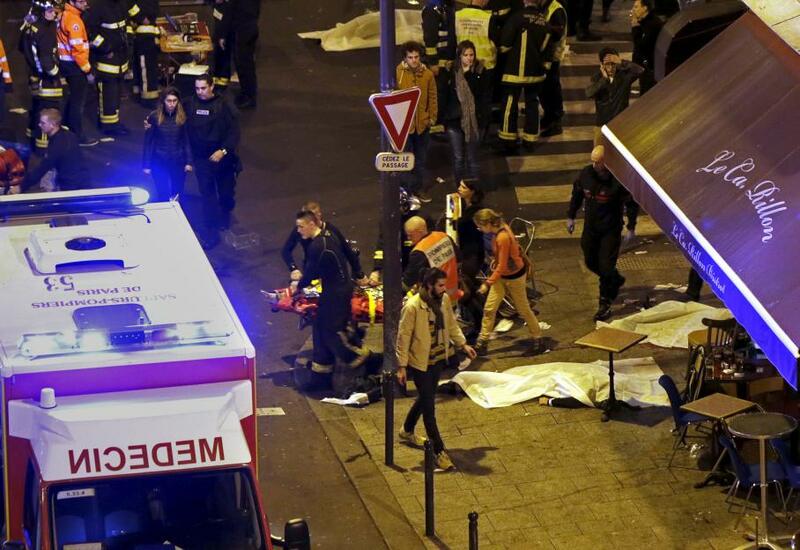 This article attempts an objective assessment of what has been revealed about people and places involved and/or implicated in the terrorist events in Paris on the 13th November, 2015. It should be read in conjunction with two previous articles here: http://veaterecosan.blogspot.co.uk/2015/12/parisfact-or-fraud-one-introduction-1.html and http://veaterecosan.blogspot.co.uk/2015/12/paris-fact-or-fiction-part-2.html and a recorded interviews here: https://www.youtube.com/watch?v=AYjTebEdZLg . It is dedicated to the people who died or were otherwise injured by ruthless planners and operatives. It is hoped it might help point to who they might be, whilst exonerating any innocent parties. Did the event described happen at all? Did the event happen as described? Is there any evidence this was a False Flag Operation (FFO)? 'False flag events' are so-called because they are organised by one party but blamed on another, either duped into acting for it (so called 'Patsies') or quite innocent of the charge, usually for political or military advantage. Many such cases have been documented over the years, one of the most scandalous being 'Operation Gladio', put into effect by NATO in the 1980's to sway European public opinion away from Communist sympathies, on whom the terrorist incidents were blamed. Increasingly it is being realised that the events of 9/11 in America fall within the same category. Perhaps it should be reiterated that the Paris outrage of 13/11, was a major psychological factor in persuading both French and British public opinion and legislators to support a three month extension to the French state of emergency (See: http://www.theguardian.com/world/2015/nov/19/french-mps-vote-to-extend-state-of-emergency-after-paris-terror ) and huge increases in military activity in Syria. (See: http://www.economist.com/news/europe/21678517-come-france-starts-coming-terms-its-worst-ever-terrorist-attack and http://www.theguardian.com/world/2015/dec/05/raf-syria-bombing-raids-isis-libya ). How it influenced the view of a new Conservative Member of Parliament can be seen here: http://veaterecosan.blogspot.co.uk/2015/12/daesh-bombing-rationale-by-conservative.html . It also provoked both President and Prime Minister to pointedly use identical language of being 'at war with ISIS', although whether this was actually more acceptable code for being 'at war with Assad and Syria', waits to be determined. alleged perpetrators of the outrage. The juxtaposition that keeps occurring between foreign policy ambitions and terrorist events, making them easier to achieve, surely cannot be disregarded, even by the most sceptical? It cannot escape notice that all the military actions facilitated by the Paris attacks, were already in an advanced state of preparation and were able to go into action immediately afterwards and that domestic emergency services and police were on a heightened state of readiness, yet unable to avert the attacks. This would be highly unlikely if the events were truly unexpected. Perhaps it should be noted that none of the questions raised in this or previous articles have been mooted in the mainstream media which rather parallels its passive acquiescence to the official explanation of the events of 9/11. The thrust of the article is not that there were no terrorist outrages in Paris on the night of Friday 13th November, 2015, or that 130 people did not tragically lose their lives because of it, but that the intricacies of the events may not necessarily support the official interpretation promulgated by the media on behalf of the French authorities. It is possible that it was a so-called 'hybrid event' containing both fact and fiction, with some reports true and some false. It is not an easy process to separate them. If there are questions, problems, contradictions or even inaccuracies, it is in everybody's interest that these are fully revealed and discussed, as huge consequences, both national and international turn on the outcome. The possibilities that must be considered are, was this event or any part of it contrived to provide a pretext for a foreign war and a domestic state of emergency or any other reason? Were elements of the government implicated in it? Was the official story about what happened falsified in any way? Were any innocent people unfairly or unjustly accused of the crimes perpetrated? Were others unidentified but known to the government involved? Were the events subsequently orchestrated by government and media, to influence public opinion in favour of a particular political agenda? Basically do the facts, as far as we know them, support the government interpretation or undermine it? Molins without saying as much is obviously suggesting a narrative of one team, presumably of two killers, moving in a regular south-easterly direction, one of whom blows himself up at the Comptoir Voltaire. It neatly fits the police story of number of teams and the individuals identified in it. However unfortunately (?) it cannot be made to fit the facts of times and other observations. As always in such disasters, timing is of critical importance when studying what is possible and what is not; what is accurate and what is not; what is truthful and what is not. It is very difficult to fix times precisely at the different locations because methodology and calculations adopted by the media varies. It is almost as if whilst pretending to clarify, obscurity is the objective. There is also significant disagreement between the early news media reports. 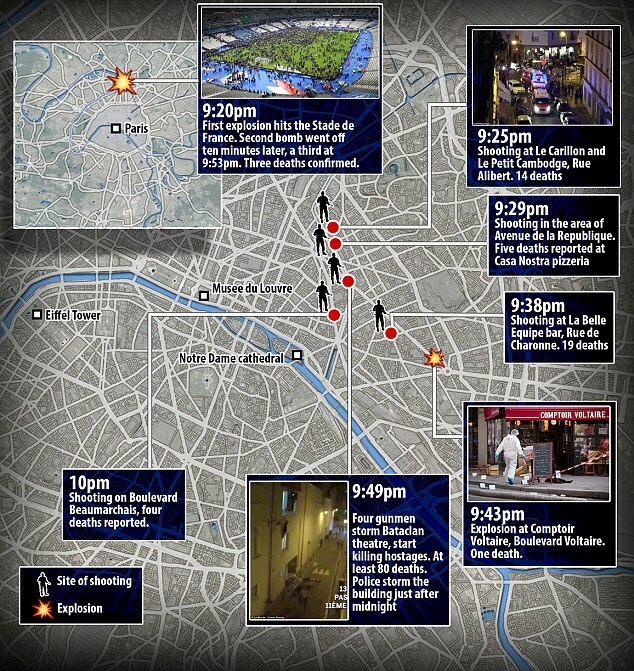 For example the time-line provided by the Daily Mirror diverges significantly from the generally agreed in a number of respects, not least that it claims the stadium bombs went off at 8.30 pm almost an hour before they did at 9.17 and 9.19. http://www.mirror.co.uk/news/world-news/paris-terror-attacks-timeline-what-6830455 . Part of the problem could be the conflation of French and British time zones (the latter one hour behind) but this cannot explain the Mirror error as the other times are all Paris times. Similarly the shooting at the Cafe Bonne Biere ('Good Beer') Restaurant is given by the Daily Mail (below) as late as 10.00 pm, although it must have been at least a twenty-five minutes earlier. We all know that errors can be made by journalists rushing to get a story to print but there is also always the possibility that they are indicative of an official briefing gone wrong, or a change from original intentions. In a previous article reference was made to a twitter account announcement of the event two days before including the number of casualties! It was quickly taken down but nevertheless indicates pre-knowledge and pre-planning by someone! Any government serious about finding out would surely discover who was behind it? Errors like this have been documented before, perhaps one of the most notorious involving the BBC announcing the collapse/demolition of Building Seven in New York before it actually took place. (See: https://www.youtube.com/watch?v=6mxFRigYD3s ) Such cases are either hidden or have to be explained away subsequently. Studying times and places, with such additional information that may have been made public regarding descriptions and vehicles, plus any video available, can give useful insight into who might have done what and where. Perhaps it is worth noting that I come at this not expecting false information from government sources, but not ruling out the possibility either. We have learned too much about the propensity of government to lie or obscure the truth, in order to secure its objectives. To take anything it says in such matters at face value, as it would appear most do, is foolish in the extreme. What we are looking for, as any investigator of a crime would, is any corroborative, confirmatory evidence that would support the story, or conversely, lead us to question it. This map comes from the Daily Mail. The timings which cannot be relied upon, are its own. So with reference to this map and with some reservations as to accuracy and sequencing these appear to the places, times and events that took place. (Suggested perpetrators: variously spelled Ahmed Almuhamed, 'Ahmad al Mohammad' 25, Bilal Hadfi, 20, M al-Mahmod. Counterfeit document bearing the name was, according to police, 'found alongside the remains of the body'! THREE terrorists attack the Stade de France at 9.20pm (21.20 hrs) during the France/Germany football match in the presence of the President of the Republic, Francois Hollande. The story is that the terrorists tried to enter Gate 'J' but were refused and subsequently TWO blow themselves up outside this and gate 'H'. (There is the recorded sound from inside the stadium of two loud bangs @ 9.17 and 9.19pm. Wikipedia has different times of 21:20, 21:30 and 21:53.) They kill one person 'passing by'. See: http://www.dailymail.co.uk/news/article-3318303/Saved-mobile-phone-Dramatic-footage-man-hit-suicide-bomb-shrapnel-terrorist-kill-six-football-match-France-s-national-stadium.html ) Later a third terrorist blows himself up some distance away (about 450 m) outside the MacDonalds restaurant, but amazingly, no one but the bomber is killed or injured. 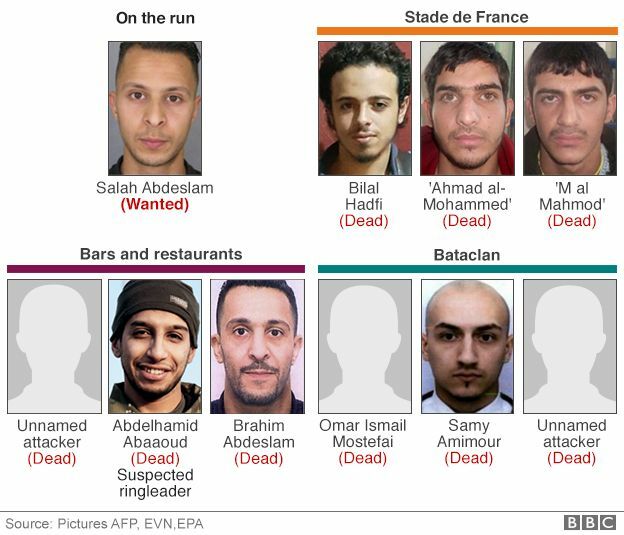 Further, two incredible interviews of unharmed close proximity witnesses can be viewed here: http://edition.cnn.com/videos/world/2015/11/19/paris-attacks-stade-de-france-bombing-witness-intvw-newday.cnn/video/playlists/paris-shootings/. In this one the 'witness' claims to have been only 'ten metres' away from the exploding man, yet was unhurt! Note towards the end of the interview, the 'product placement' of 'Fanta' and a specialist sandwich, commonly appearing in such incidents, referred to in a previous article! Another appears here: http://mariogists.blogspot.co.uk/2015/11/paris-attack-survivor-says-cellphone.html?showComment=1449942138506#c7364226870716669923 . Note this time the 'product' is the life-saving Samsung mobile phone. Some might think the story is far-fetched to say the least. Notice also the difference between the times of the attack (9.20) and the time of reported explosion sounds (9.17) which would make the actual start of the incident – being denied entry etc – at least ten minutes earlier than 9.20, say 9.10pm. The third explosion happens at about 9.50 pm (9.53 is quoted) well away (approx. 450 yds) from the stadium and no one is injured by it. This immediately raises a serious question: why if these were genuine, fanatical suicide bombers, dedicated to causing as much mayhem and death as possible, was only one person killed out of the potentially 70 - 80,000 who apparently attended the stadium including the President himself? And why would the third bomber take himself away from the main concourse and explode his device away from people and property? So are we to believe a major event between Germany and France with the High Officials of both countries in attendance, with terrorist attacks still fresh in the memory, heightened tensions in Syria and a state of emergency in France itself, this event and location was not considered a prime target for terrorists and no police or army presence was provided at the entry points, let alone the terrorists being engaged by them? Nor is there any evidence that even after the 'explosions' is there any sense of urgency or protection inside the ground. The game is not abandoned and the President's protection detail take a very relaxed view to the danger and his safety, and although ushered out of his seat, he remains a very obvious target in the glass fronted commentator's box. The German representatives do not even leave their seats. This can only indicate either extreme incompetence or the certain knowledge that no real risk was posed inside the ground..
More importantly and incredibly, despite the President himself being in the arena at the time and a generally heightened sense of national threat, the official story states that the only reason the suicide bombers did not enter the stadium was because they were challenged by the gate keeper. Not a mention of police or army in this account. Nor is the account that the gate-keeper checked for a suicide belt and refused entry when he discovered it credible on a number of counts. A suicide bomber intent on getting inside - we are told he had a ticket - would not have waited till well after the game was under way to try but would have entered earlier, mingling with the crowd. The first thing that would have happened when he was stopped would have been to raise the alarm and call on police support. There is no evidence this happened, let alone that the discovery in such an important area would have been just left to a gate keeper. A potential terrorist would surely have been arrested, challenged or even shot by armed police immediately the alarm was raised? The next unbelievable aspect of the story is that on being challenged he does not attempt to run away but merely "steps back and explodes his vest". Yet only one "passer-by" is killed - we are not actually sure by which of the three blasts - but the gatekeeper and presumably others in the vicinity are unharmed! This is simply incredible. Both second and third bombers appear to go off without being challenged in any way as far as we are aware. As I have said, if there were three genuine, committed suicide bombers at this location, their tactics are quite impossible to rationalise, simply because if they wanted to make a brutal impact, and this is what is suggested happened elsewhere, why did they not have a better plan for getting inside or just set off the bombs as people entered or left the game? And why would the 'third bomber' if the plan had failed, either make a greater attempt to do harm or simply abort the operation and fade into the night to await a later and better opportunity? If the third bomber exploded at 9.53 as alleged, it would appear he has actively endeavoured to do as little harm as possible. However I think the 'clincher' is the fact there appears to be no hard evidence to support the claim that three devastating explosions took place. There are virtually no films of the scene before or after despite film crews outside and in the vicinity. All film is devoted to people leaving the stadium perhaps an hour or two after the blasts. Given the description of events there must surely have been huge damage to structures at both the ground and McDonalds, the sort of thing cameramen always capture, but nothing as far as I know has been published. That can only mean one thing - there is none and it didn't happen as described. As to this photograph purporting an explosion site great difficulties are posed. Virtually no structural damage is evident. (See above) Specifically none of the railings appear deformed of splattered in any way and sheet glass windows in close proximity are completely undamaged. Further there appears to be little evidence of body parts or structural damage at the explosion locations. If it is argued that the body was atomised by the explosion the absence of apparent structural damage is very hard to explain away as is the story that an undamaged passport was discovered at the site! A quite ludicrous picture of it in pristine condition is here: http://vid.alarabiya.net/images/2015/11/14/1a5d5abb-d4e5-4be5-84a0-438bb42bc1cb/1a5d5abb-d4e5-4be5-84a0-438bb42bc1cb_16x9_788x442.jpg . This alone screams 'fraud' from the rooftops doesn't it? All these factors must raise serious doubts that all or any of the official account accurately portrays what actually happened. Were there even suicide bombers at those locations? Did bombs go off in the way described or were loud bangs generated just for effect? If the story is largely fantasy it casts a very ominous light on all the things that went on that night. One thing is clear and that is that if three suicide bombers ended their lives in the vicinity of the stadium, they could not have been involved in any other of the alleged or actual incidents elsewhere in the city and some distance away. This must of necessity remove any possibility that the three identified bombers at this location were involved in any other location, as the timing coming before the others, and distance does not permit it. So the restaurant/bar/concert hall attacks MUST be by different people for which we now have FIVE left if the eight stated with some certainty by the police is to be relied upon. The next logical step if THREE were involved in the Bataclan (also all killed) only TWO remain to carry out all the restaurant attacks UNLESS the Bataclan team prior to it were responsible for some of them. How they were able to establish the identity of attackers so quickly, if the bodies were blown to pieces? How did the document survive virtually undamaged despite the body disappearing? Why would terrorists leave an implicating parking ticket in VW Polo. Where was the Polo? At the Stadium or at the Bataclan, or were there TWO Polos used? Or yet again is the contention being made that the three at the Bataclan first dropped off the three at the Stadium before driving the several miles to the theatre? If the Bataclan Polo was filled with the three attackers, how did the Stadium attackers get to it? Perhaps they caught the bus? 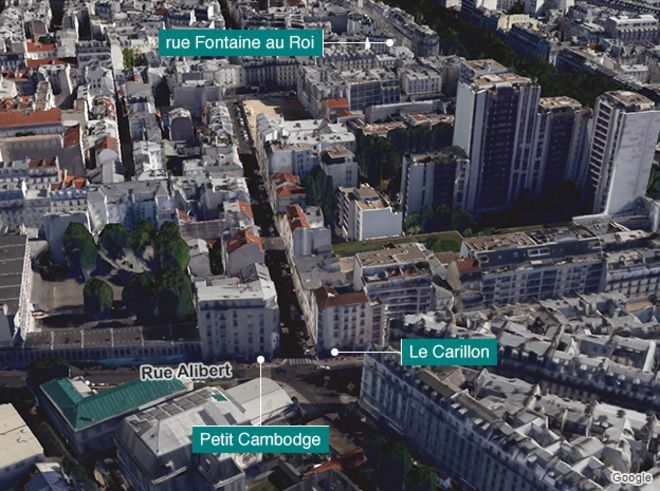 20, Rue Alibert, 75010 Paris, France. These different venues are apparently owned by the same people and tend to compliment one another. Timing and distance rule out any possibility that this attack was carried out by anyone involved in the Stadium incident. Fifteen people are killed here by a man with a semi automatic rifle. 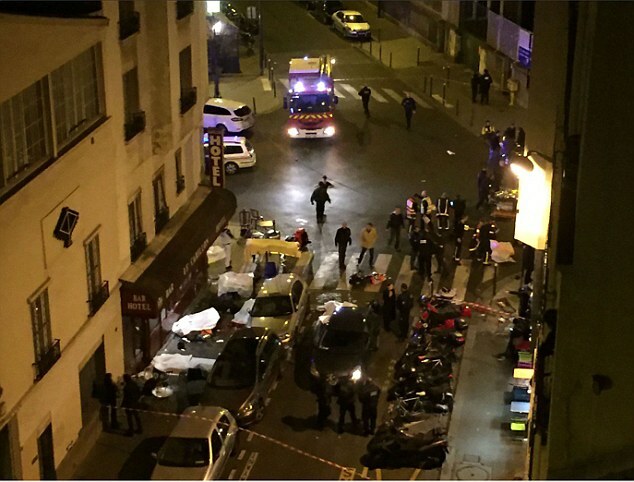 An eyewitness said one of the gunmen shouted “Allahu Akbar” very reminiscent, it should be said, of the Charlie Hebdo attack. The Herald Sun reports it thus: “British-Danish psychotherapist Mark Colclough, 43, was with a colleague on Rue de la Fontaine when he saw a gunman attack one of the cafes. There is little doubt that the events as described took place and many (15) innocent victims were murdered (15) or injured here, to whom we pay our respects. There is doubt however if the people accused Abdelhamid Abaaoud, Brahim Abdeslam and an unnamed third person, did it. In fact evidence appears to point in the opposite direction. The one reliable witness report above does not fit and there appears to be no evidence of more than one attacker although we presume a driver remains in the vehicle. This modus operandi appears to be repeated at the next attack site and is rather confirmatory of the same team. As this is the first two of the six claimed restaurant locations, and the Casa Nostra is next, it is reasonable to assume the same people were involved. If this is true, and the 'Daily Mail' video of the latter attack is reliable as it seems to be, there is conclusive evidence that the accused were not involved in this attack either, as that gunman appears white, thick set and middle age with no hint of Arab background. We note from this only one gunman is referred to and significantly that he is left handed. Those that knew the accused will be able to relate this fact to them. Also not only is he very cool and calculated but if the witness' memory is correct about the number of shots fired ('15 or 20') deadly accurate, as fifteen people are murdered at this location. It is borne out by the description of the short bursts. This is not a youth high on adrenaline I would suggest but a trained individual, cold and calculated. It points to someone with military background. This eye witness account is not supportive of three Arab attackers. The description of him being 'left handed' could be a decisive factor in ruling certain individuals out, if not 'in'. Rather strangely this location is often left off maps and descriptions and is subject to conflicting reports as to the time of the attack and how it fits in the sequencing with the others. It is not altogether clear what time this premises was attacked. It must be known because we are told it was on CCTV. 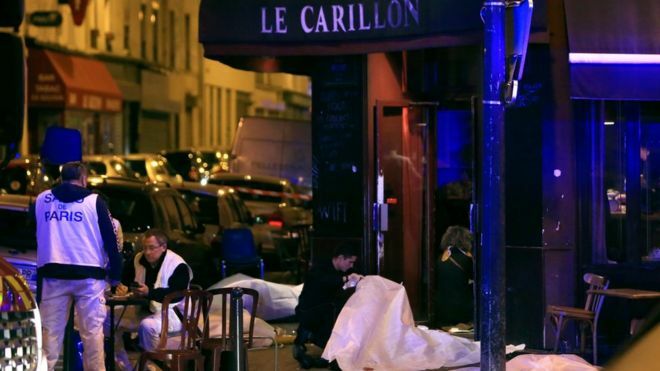 However the Mail map above puts it at 10.00 pm whereas this New York Times article here: http://www.nytimes.com/2015/12/05/world/europe/la-bonne-biere-cafe-hit-in-paris-attacks-is-back-in-business.html states, “Just 20 feet away, the Casa Nostra Pizzeria, where one person was killed as the terrorists moved on from La Bonne Bière, remained closed, with three large bullet holes from Kalashnikov rifles pocking a window.” This puts the 'Good Beer' BEFORE Casa Nostra i.e. about 9.30pm. This is a very significant difference that should be explained as it impinges on who was able to do it and their route. There is an obvious problem with this report insofar it claims just one death at the Casa Nostra rather than the later five but it makes the clear point as discussed earlier, that the gunmen moved north west from here, not the other way around. The question is can this be relied upon? 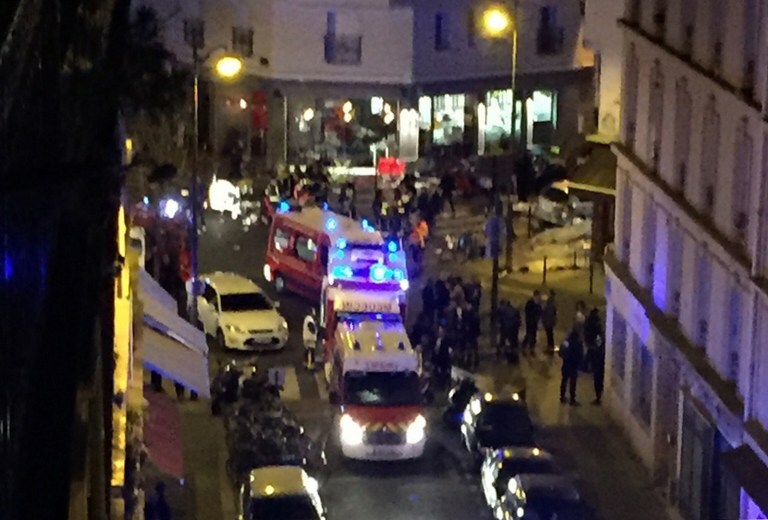 At 21:32, a man with a Kalashnikov rifle fired shots outside Café Bonne Bière (WIKI) Note this conflicts with the report of two gunmen. The Times reported that, "The fourth attack came on Rue de la Fontaine au Roi, when the same unit of terrorists (me: probably a gunman and driver) drove the 500 yards from the Le Carillion to the Casa Nostra pizzeria and opened fire on diners, killing at least five." This time the vehicle is identified as a black Seat. Luckily(?) at this location the action is caught on no less than three internal cameras, the footage of which is subsequently obtained and published by the Daily Mail, presumably satisfied as to its authenticity. The video shows the attack taking place. It was purchased and made available by the Daily Mail in London. This shows just one gunman in action spraying the front of the cafe and it appears, sparing the life of a female customer outside, who is seen running off. It is claimed five people were killed outside. The video indicates no one was killed in the restaurant itself and even a customer sitting outside at whom he points his weapon, is not harmed. It is suggested he might have run out of ammunition at this point or the weapon jammed. However evidence of later shots seem to contradict this. The face of the attacker is briefly seen. Whether his face matches any of the accused is far from clear. It appears from thick set head and body he is likely to be forty plus – much older than the accused. It is claimed this attack emanates from a black Seat that is later found abandoned a couple of miles away. It is also suggested the same gunmen (did the driver remain in the car throughout or was he alone and also the driver?) moved on to the La Belle Equipe where 19 individuals were shot dead. However the timings do not support this, for how were they able to cover the mile that separated them in only a minute? He/they do not leave the Casa Nostra until gone 9.34 pm. if the video or witnesses can be believed. The Belle Equippe shooting starts at 9.36 pm and there is a mile of city traffic between them! 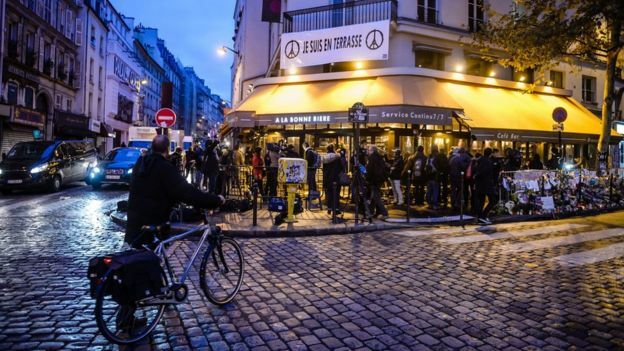 What is certain is that the French authorities were not at all pleased that the video was released and have informed the owners of the bar that unless and until it is returned, it will debar them from receiving government compensation. A dispute with the Mail is on-going. Another rather interesting and undiscussed feature is that the video appears to indicate a time of one hour LATER – i.e. 22.34! This is rather hard to explain. It replicates but in the opposite direction the error at the Stade de France already referred to. Some have suggested that the video is actually has been staged to have the appearance of an attack and that the woman who rushes inside is an actor lobbing in a smoke grenade as she does so! This is impossible to determine one way or another but there is sufficient here to regard the genuineness of the attack and official account of it, with caution. Clearly both versions cannot be true as they differ significantly. Nor does the timing of the video accord with the claimed time of the attack. If the video is not genuine it raises the question who would be in a position to make it? On the other hand if the video is accurate the official account cannot be! Perhaps before continuing we should note in passing that the name of the establishment is rather unfortunate as it of course refers to the Sicilian Italian mafia and is literally translated as 'our thing'. The Daily Mail of the 14th November quotes a 'witness' to the attack at the Casa Nostra pizzeria as seeing, 'a terrorist dressed all in black 'like a combat soldier' firing short bursts from a machine gun.' http://www.dailymail.co.uk/news/article-3318086/11-dead-terrorists-open-fire-Paris-restaurant.html#ixzz3twRQW2q0 This is specifically and clearly contradicted by the video referred to above showing no such thing. Indeed the killer on it is wearing a white shirt and nothing black at all - neither bullet proof vest or balaclava. The film also pointedly CONTRADICTS the police claim that ALL the attackers wore suicide vests. This suggests either that the Mail was deceived about the validity of the video, or the 'witness' and police stories are unreliable or fabricated. The significant question here is whether the same team in the same seat car could get from the Casa Nostra to the Belle Equipe, a distance of about a mile in Friday evening traffic, within two minutes? I doubt an emergency vehicle with sirens blazing could achieve that. So the claim that it was the Casa Nostra team that also carried out the Belle Equippe attack is subject to serious question. Of course if they didn't do it, another team would have been required. We might also note that the police reported all 7/8 attackers wore suicide vests. Clearly the shooter at Casa Nostra DIDN'T. In fact he appears to have been dressed very casually with no mask or bullet proof vest – just a light shirt it appears. You will notice that this account in the Telegraph of 21st November here: http://www.telegraph.co.uk/news/worldnews/europe/france/11995246/Paris-shooting-What-we-know-so-far.html does NOT accord with the earlier Times report in a number of respects. In particular it states the Casa Nostra was the last attack site, whereas the Times placed it six minutes BEFORE and this is without factoring travel time from one to the other (shall we say five minutes?) I have not read of any witness statements referring to the car rushing between the two which surely must have attracted attention if it had occurred. That is the best piece of investigative journalism concerning the Paris event that I have seen. Isn't it pathetic that overpaid journalists working for British mainstream titles can't get round to producing impartial critically analytic work like this? Your work on exposing the Hampstead cover-up for what it is just heaps more shame on Britain's corrupt media and justice system. That's very kind of you James and surely not deserved. I had intended to deal with all the sites in this but got so bogged down I thought it best to at least get this posted. The remaining points have equally dubious facts to reveal and I will try to put it up soon. I apologise for the errors and oversights that have slipped through which I hope to correct. There is indeed a lot of mendacity in high places and in my humble opinion those that are sacrificed for it are best remembered by an attempt to get at the truth. Your moral support is much appreciated. Tim Veater.